Impact Wrestling is back on POP tonight. The show will also be available tomorrow on-demand for subscribers to the Global Wrestling Network. Eddie Edwards will challenge Austin Aries for the Impact World Championship tonight. Another former Impact World Champion will also be in action as Pentagon Jr takes on Matt Sydal. Eddie Edwards has spiraled out of control ever since his feud with Sami Callihan. His obsession with his rival has caused Edwards to jeopardize his marriage and career. Tonight, however, Edwards has a chance to win the Impact World Championship. The former GHC Heavyweight Champion will have a tough task tonight, however. Austin Aries has been a fighting champion since winning the belt earlier this year. Edwards may represent his most significant test yet, however. Last week on Impact, Konnan pulled back Santana and Ortiz after they attacked the OGZ. LAX looked to have the upper hand in the melee but Konnan withdrew his troops and later claimed the OGZ were setting a trap. Konnan then told his team they need to wait for the right time to get their revenge and take back their property, the Impact tag-team titles. Is that time tonight? We’ll find out in just a few hours. Alisha Edwards returns to the ring tonight. She better hope her marriage problems with Eddie Edwards aren’t occupying her thoughts, however. Any weakness will be exploited by her opponent Tessa Blanchard. Aside from two losses via pinning combination to the veteran Madison Rayne, Blanchard is undefeated in Impact Wrestling. She will look to move closer to a Knockouts Championship match by beating Edwards tonight. Last week, Blanchard was quite upset that Allie was being positioned for a title shot after being Su Yung in tag action. Blanchard defeated the hometown favorite Allie at Slammiversary. 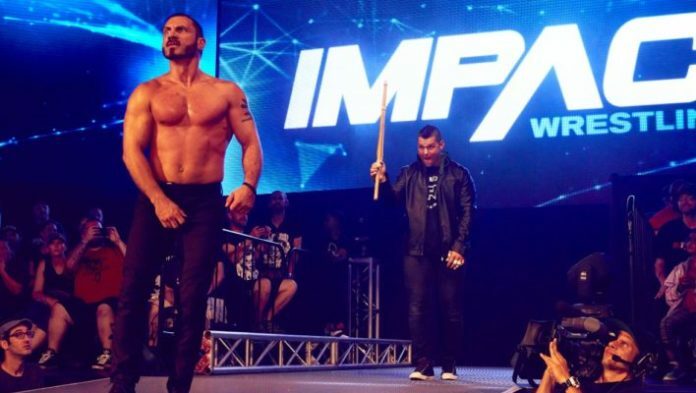 Two weeks ago on Impact Wrestling, the Desi Hit Squad attacked Taiji Ishimori and Petey Williams after their single’s match. Ishimori defeated Williams but after the bout, the Great Gama Singh ordered his disciples to take out the X-Division wrestlers. The Desi Hit Squad have been winning their matches through under-handed tactics or clever tag-team wrestling as of late. They will have their biggest test yet when they face two former X-Division Champions tonight. Matt Sydal vs Pentagon Jr.
Last week, Matt Sydal said the X-Division Championship is no longer his destiny. The X-Division title, he said, chose Brian Cage. Now, Sydal must follow a new path. As for Pentagon, he comes into this match knowing Sami Callihan will be watching and waiting.